When you ask a Christian, ‘What is your religion?’ their answer probably will not be ‘I’m a Christian.’ They are much more likely to say ‘I’m a Baptist’ or ‘I’m a Presbyterian’ or ‘I’m a Unitarian.’ In general, most Christians identify themselves with a certain denomination, or sect of their religion. This variety is not unique to Christianity. There are several denominations of Islam, Judaism, Buddhism, and all of the other religions out there. However, none can match Christianity for sheer numbers. There are approximately 41,000 different denominations of Christianity. Some of these denominations differ on fundamental notions – the Greek Orthodox Church does not try to convert non-believers, whereas Evangelicals do little else. Others denominations differ in terms of practice – compare the staid ceremony of Anglicans to the tongue-speaking spectacle of Charismatics. Others are so similar, only initiates can discern one from the other. The only real difference between the ‘Christian Church’ and the ‘Church of Christ’ is that the former uses musical instruments in their worship, while the latter prefers to sing a capella. And yet, with all of these differences, these denominations coexist peacefully. Churches of various denominations can be found within walking distance of one another. 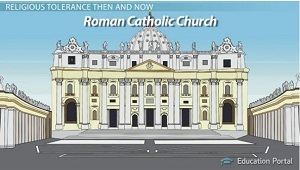 The dominance of the Roman Catholic Church remained unchallenged for nearly 500 years. Then, in 1517, a German priest shook the Catholic Church to its very foundations. His name was Martin Luther. Luther was not a rebel. He wasn’t trying to destroy the Catholic Church or even start his own religion. All Luther was trying to do was to stop the Church from engaging in some practices that he considered unchristian. Luther’s problem was with the Church’s practice of selling indulgences. An indulgence is a remission of punishment for sins. You can think of an indulgence as a ‘get out of hell free’ card. The church had been in the practice of granting indulgences in exchange for good works and acts of piety for centuries, ever since Pope Urban II offered indulgences to Crusaders in 1095. Luther questioned whether the church had the authority to grant such indulgences. He believed that the only true path to salvation lay through faithfulness to Christ and his teachings, not through adherence to the ideologies and dogmas of the Catholic Church. Yet Luther probably would not have made a fuss if it weren’t for the fact that these ‘get out of hell free’ cards weren’t actually free. Earlier that year, in 1517, Pope Leo X had made an unconventional move. Leo wanted to rebuild St. Peter’s Basilica in Rome, but he didn’t want to spend his own considerable wealth to do so. This is not surprising, as Leo was a member of the wealthy Medici banking family, which dominated Florence. The man was more of a banker than a priest. Leo’s solution was to begin offering indulgences in exchange for donations to the Basilica’s renovation. While these donations technically counted as pious works, Luther saw them as simple payment. To Luther’s eyes, the Church was essentially selling salvation. He witnessed poor peasants giving up their life savings to buy an indulgence for a dead relative, in the hope of saving their loved ones from the tortures of purgatory. All the while the Church grew ever richer. So, Luther set about writing 95 complaints with the Church’s greedy behavior. These complaints are now called the 95 Theses. On October 3, 1517, Luther nailed his 95 Theses to the door of the Church of Wittenberg and sent copies to the higher authorities of the Catholic Church. Luther’s 95 Theses spread across Europe like wildfire. Within two months, they were being read in cities across the continent. The next year, they were translated into German and printed on a massive scale, further fueling the controversy. 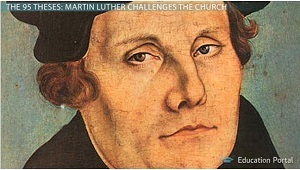 Luther suddenly found himself at the center of the greatest conflict of his age. The Pope was not happy at having his scam with the indulgences exposed. He had Luther accused of heresy. A couple of years later, in 1520, the Pope wrote a letter to Luther in which he banned any further distribution of Luther’s 95 Theses and demanded that Luther recant his heresy or face excommunication, or being cut off from the Church and its sacraments. This threat of excommunication was a big deal, since pretty much everyone believed that the only way to get to heaven was to receive the sacraments of the Roman Catholic Church. Since Luther did not think he needed the papacy to achieve salvation, he did not care if he was excommunicated. Luther publicly burned the Pope’s letter and thereby broke all ties with the Roman Catholic Church. The upshot was that Luther was condemned. The Holy Roman Emperor, Charles V, published the Edict of Worms, calling for Luther’s immediate arrest. Yet Luther’s supporters would not let him be imprisoned. Instead, they spirited him away and hid him in Wartburg Castle. Luther held the Bible as the highest authority, higher even than the papacy. He realized that so long as people could not read the Bible, they would continue to fall for the lies and deceptions of Catholic ideology. 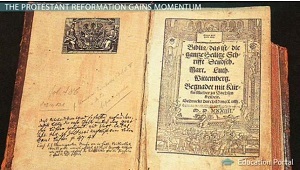 Luther’s supporters smuggled his translation out, and soon printing presses across Germany were cranking out copies of Luther’s Bible. The publication had the desired effect. Meanwhile, the Zwickau spread across Germany, burning churches, monasteries, bishop’s palaces, and libraries, often in Luther’s name. The Zwickau were determined to use Luther’s treatment by the Church and state as a rallying point for their revolution, regardless of Luther’s feelings on the matter. This uprising, which became known as the Peasants’ Revolt, was but the beginning of about five centuries of nearly unending bloodshed. The Protestant Reformation swept across Europe, spreading first to the Netherlands, then to France and England. Soon all of Northern Europe was in the throes of religious warfare as Protestants fought Catholics for the soul of Europe. To review: in 1517, Martin Luther published his 95 Theses in an attempt to get the Roman Catholic Church to stop selling indulgences, or ‘get out of hell free’ cards. Luther did not think the Church had the authority to grant such indulgences, especially not for money. Luther believed that salvation could be achieved through faith alone. The Church responded by labeling Luther a heretic, forbidding the reading or publication of his 95 Theses, and threatening Luther with excommunication. Luther refused to recant his beliefs. 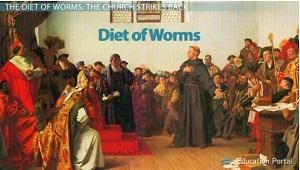 The next year, in 1521, Luther was summoned to appear at the Diet of Worms, where the leaders of the Holy Roman Empire would decide his fate. When Luther once again refused to recant his positions, the Holy Roman Emperor, Charles V, ordered his arrest. Luther’s supporters hid Luther in Wartburg castle, where he completed a translation of the Bible into German, as well as publishing a variety of treatises against the Church. By the time Luther returned from his exile, Germany was in the grip of a Peasant Revolt, as peasants burned and destroyed all things Catholic. Luther calmed the revolt in his hometown of Wittenberg and established his own Lutheran Church in 1526.